"Women Walk On Water" graphic by talented artist Erin Witters of The Salty Life Co.
Adi Mahan...talented, inspirational, determined, and putting together a documentary on women in the surfing culture. Her project, "Women Walk On Water", dives into the talented, the controversial, and the way women are seen, presented, and represented surrounding the sport and lifestyle. ESTERO has partnered up with Adi in a fundraising campaign to make her film come to fruition. 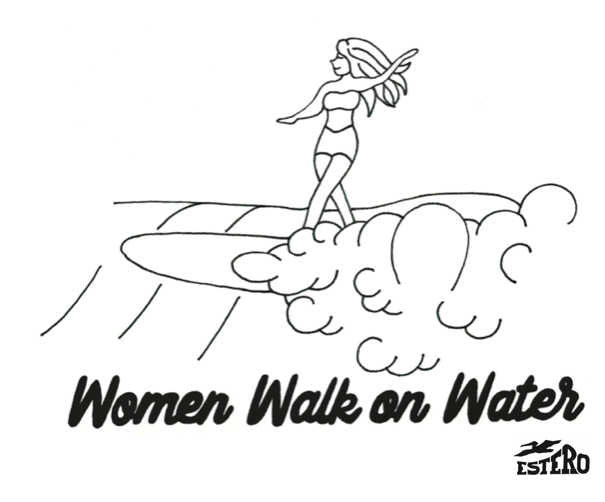 Look for ESTERO / "Women Walk On Water" collab tanks and tees at this Thursday's Farmer's Market in SLO! The collab apparel will be available on ESTEROpaddle.com if there's still stock left from the Farmer's event.